Taft Fundraiser is something you should read. 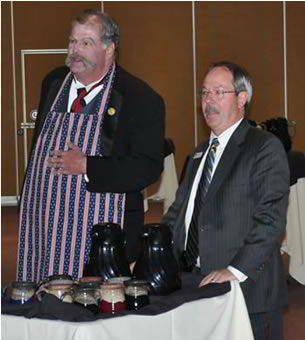 President William Howard Taft and Mount Rushmore Society development director, Gary Keller served guests coffee. The Mount Rushmore Society hosted a fundraiser at the Rushmore Plaza Civic Center on November 23, 2013. Silent and live auctions, and drawings for some wonderful prizes added a bit of fun and excitement to the evening. The success of the evening would not have been possible without the sponsors, those who donated items for the auction, and all the commitees involved. Master of Ceremonies and Mount Rushmore Society President, Andy Knight introduced President Taft (as portrayed by Dale Liikala) and presided over the evening's events.